One of the things I love to do in life is play with words. That’s easy. One of the things I long to do in the world is make positive changes. That is easier said than done. In my college days, it seemed like I could wave a magic wand and change would happen. That is part of the wonderful delusion of youth, but it felt good nevertheless. Not voting for Nixon at age 21 was “really cool” and “helped create change”. Today I realize all the legal jargon, kabuki theater, etc that keeps change from happening, that really should be happening. Here is a for-instance. When SeaWorld and similar entities launched their ventures, it was a good thing. It was very difficult for humans to get close to wild sea mammals, and this seemed an ideal way to do so. However, studies were being done at the time and it did not take long before oceanographers and other scientists realized that such animals have feelings very similar to humans, thought processes very similar to humans, and were basically family animals. They also communicate using extremely loud shrill sounds. When these sounds bounced off a concrete wall such as a pool, it echoes again and again driving the animal insane. Not some of the time, but every time. Though we see smiles on the faces of Orcas and dolphins, those smiles are simply the structure of their jaw bones. They are not smiling but crying miserably. Most are suicidal and some are homicidal as we have seen. Investors have a great deal of money in these entities and are not about to let them go without a fight. And of course being a “little guy” or a “cartoonist”, all I can do, at most, is speak out with my humor/cartoons and on social media to help gain attention to this atrocity. And I will continue to do my part until I can no longer do it. 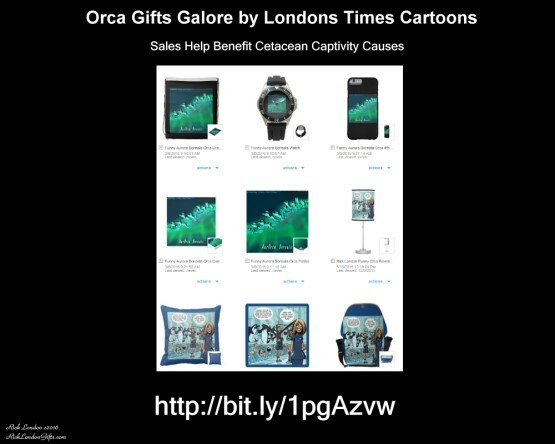 Orca cartoon items are wonderful gifts and collectibles. To view my Orca collection of clothing, eco-friendly bags, pillows, lamps, playing cards, mouse pads and much much more…..
All who know me know I love animals. I’ve loved them since I was a young child. And not just cats and dogs but animals living in the wild. I spent a great deal of time outdoors in my youth, and that love of the outdoors and nature never left me. I’m fascinated with how nature works and continue learning about it, and the animals who are a great part of it, and I learn something new every day. But just being there and observing is not enough. I grew up near the Ms. Gulf Coast and watched cetaceans such as dolphins and sperm whales merrily swim the beautiful waters. 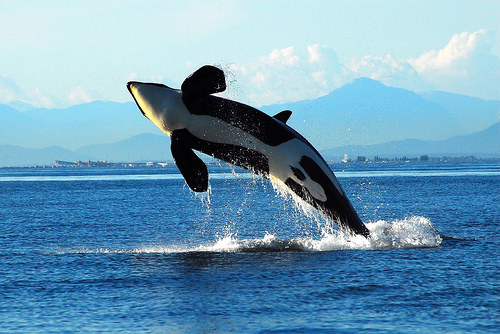 And though I don’t believe we had Orcas, I always imagined what kind of wonderful time they had in the wild. After all most of these creatures swim between 30-100 miles a day just for minimal health. I still remember in my youth hearing about Seaworld and other such cetacean captivity environments and never could get answers as to why that was allowed to happen. After all, these creatures communicate with a loud shrill sound, and such sounds bouncing off concrete walls seemed it would be aggravating. I would later learn it drives them insane, depressed, and suicidal. I decided to research on my own (animal sciences) and sure enough Seaworld and other such wild animal prisons are truly nothing more than torture prisons. I felt powerless to do anything, however. I wrote letters to them and they would politely write back that they treated their animals with the utmost of care (yada yada yada). I knew better. When I learned that I had “cartoons in me”, I decided I would do a series of Orca and dolphin cartoons which I’ve done and will continue to do. And though that is just a drop in the bucket as far as letting Seaworld and others know they are running archaic businesses that need to be closed, every little bit helps. When such places opened 1/2 century ago, they were useful. They were created to show people and allow them to observe sea creatures they would otherwise never see. However animal science has shown that such captivity is cruel and unusual punishment and these creatures are extremely intelligent and desperately need to live in the wild. Seaworld has decided to ignore that science for the sake of profits. In addition, there are plenty of other venues now that don’t harm the animals in which people can observe and study them in their true habitat. The entire “mission statement” of Seaworld and others like it is obsolete. 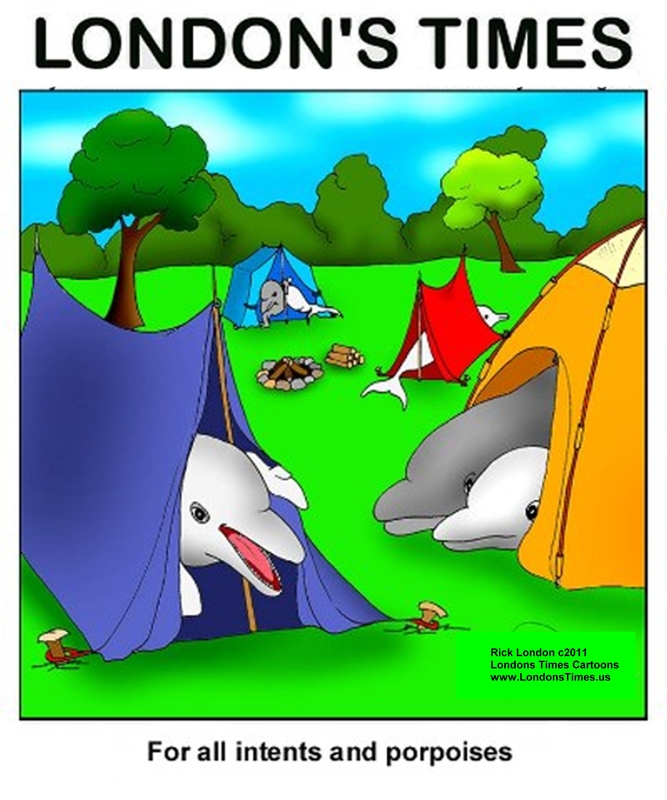 I will be running more Orca and dolphin cartoons over the years and tweeting and mailing them to Seaworld. Chances are they will not do a lot of good….on their own. But if enough people send letters, cartoons, drawings, pleas, etc., finally they will have to listen. Already their stock is plummeting. That is a start. It is just a matter of time before they are out of business. The question is, will they go gracefully (its almost too late for that) but there’s still a small timeline, or will they go out of business kicking and screaming with a legacy of cruelty and obscene torture? Only time will tell. Meantime, here’s a good chance to laugh at their latest tv commercial created to “change our minds” about them. Didn’t work for me. Did it you? 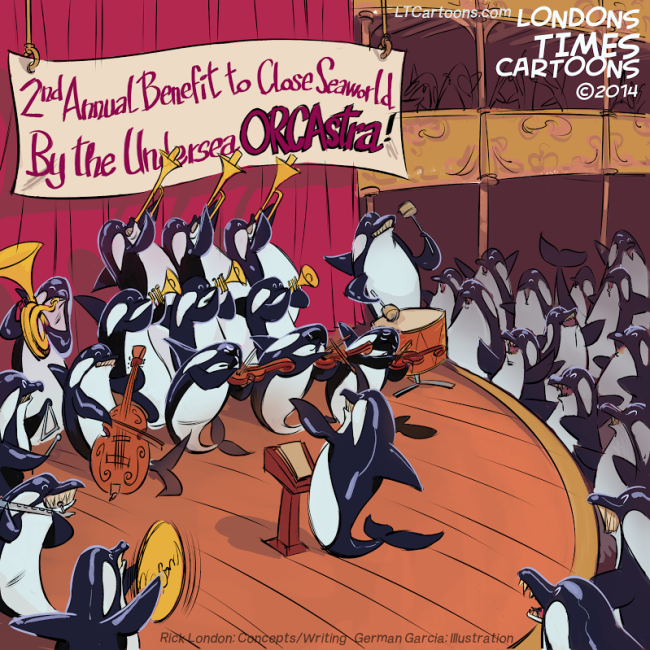 Rick London is a writer, cartoonist, songwriter and designer. 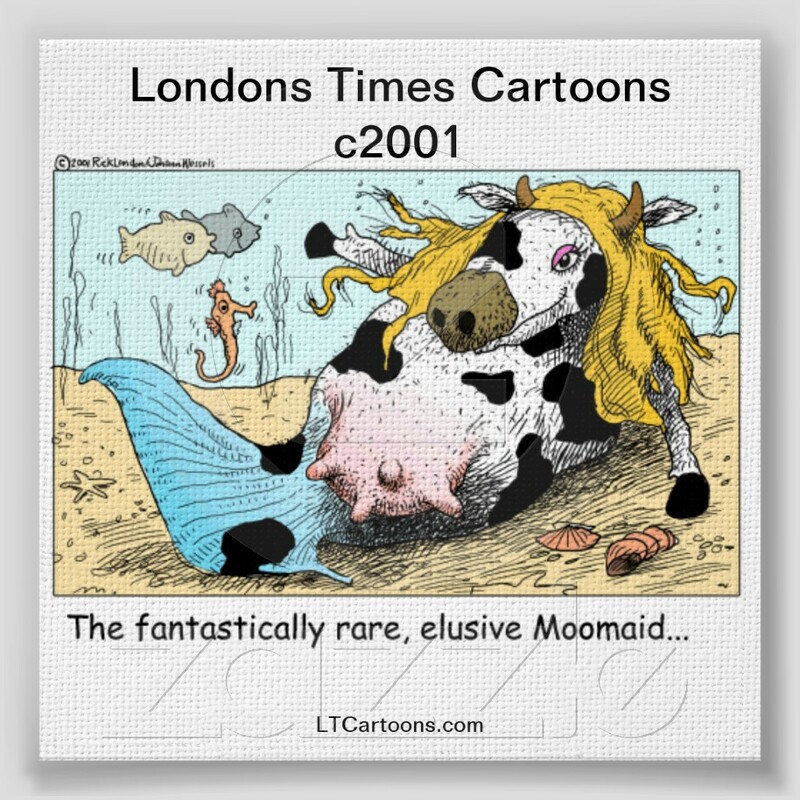 He is best known for his Londons Times Offbeat Cartoons & Funny Gifts. He is married to Lee Hiller-London aka Lee Hiller who is a popular nature and wildlife photographer as well as gift designer.